Soldiers from 3rd Battalion The Royal Regiment of Scotland (3 SCOTS) received a rapturous reception as they took part in a homecoming parade in Inverness on Wednesday. 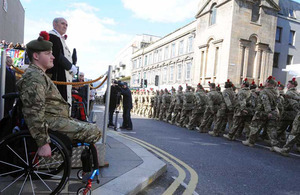 About 2,500 people lined the streets of Inverness to welcome more than 450 soldiers from 3 SCOTS, who are based at Fort George, nine miles (14km) away. To welcome the troops, crowds lined the route and clapped, cheered and waved Union flags. The biggest cheer came when the regimental band struck up ‘Scotland the Brave’, with many singing along. It is brilliant to be back home and a real honour for us to march through Inverness. The march is something to say thank you to those who have looked after us, both the families here and those who have sent parcels and good wishes when we have been away. It is a real privilege to be able to march through the city and it means so much to the boys that their efforts are appreciated. The families have a rough time while we are away, because they spend so much time worrying about our safety. The way the communities look after them is superb, and overall it is just a relief for us and for them that everyone has come home. After the parade, the soldiers, who spent six months in Helmand tackling insurgents and training the Afghan security forces, took part in a service at Inverness Cathedral. Inverness was the first of a series of homecoming parades they have planned. Others will take place in Forfar, Kirkcaldy, Dundee and Perth before the troops enjoy a well-earned month off.